Evaluation and grading must reflect achievement and progress over time in relation to specific learning standards or student goals; evaluation is tied to learning, not behaviour and attitude. Often teachers find that grading interferes with genuine student learning, and that grades, rather than learning, become the primary driver for students, ultimately, creating a disconnect in their learning. 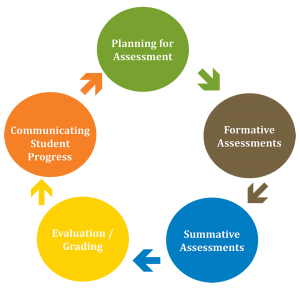 To more accurately reflect where students are with their learning and to illuminate what they understand and can do, teachers need to create assessments that are ongoing, varied in nature and administered over the course of the year. These assessments should be designed to closely tie to the curricular competencies and the content of the course, reflecting relevant and authentic experiences for the students that create a clear picture of student strengths and weaknesses. Teachers’ professional judgement can supersede a calculated grade; however, teachers must ensure the conclusions they reach about student achievement are based on a sufficient number of assessments of learning and reflect student achievement of the intended learning outcomes (Cooper, 2010). 1) Align assessment to specific learning standards. 2) Set up grade book by curricular competencies. 3) Use rubrics to show students what level of achievement required. 4) Have student co create rubrics. 5) Have students maintain a portfolio of their work and submit work they feel meets the required standard. 6) Mark fewer assignments – provide formative feedback on some assignments. 7) Attribute greater emphasis to more recent achievement when determining report card grades/levels. 8) Talk about where students are at on a regular basis so that report cards are not a surprise to any of the parties. 9) Use professional judgement, based on student grade trends, to determine the grade. 10) Do not include behaviour in grade calculations. Five key strategies for effective formative assessment. Ken O’Connor on fixing grade books by organizing by standards. On teaching learning targets. Tip 1: Breakdown standards and use your Learning Targets at the beginning and the end of the lesson. Tip 2: Have your students take ownership of their own learning and the own Learning Targets. Tip 3: Make sure you asses students progression of the Learning Targets. How does communicating the learning target impact student learning? Communicating Student Learning on NVSD portal. Brookhart, Susan M. & Moss, Connie M. (2012). Learning Targets: Helping students aim for understanding in today’s lesson. Don Mills, Ontario: Pearson. Brookhart, Susan M. (2017). How to use grading to improve learning. Chappuis, Jan (et al). (2011). Classroom assessment for student learning. Don Mills, Ontario: Pearson. Cooper, Damian. (2007). Talk about assessment. Nashville, Tennessee: Thomas Nelson Incorporated. O’Connor, Ken. (2011). A repair kit for grading. Don Mills, Ontario: Pearson. Schimmer, Tom. (2016). Grading from the inside out. Bloomington, IN: Solution Tree Press. Winger, T. (2005). Grading to communicate. Educational Leadership, 63(3), 61-65. Wormeli, R. (2011). Redo’s and retakes done right. Educational Leadership, 69(3), 22-26.